Go-Ahead Group has announced the appointment of Martijn Gilbert as Managing Director of its Newcastle-based bus operation, Go North East. 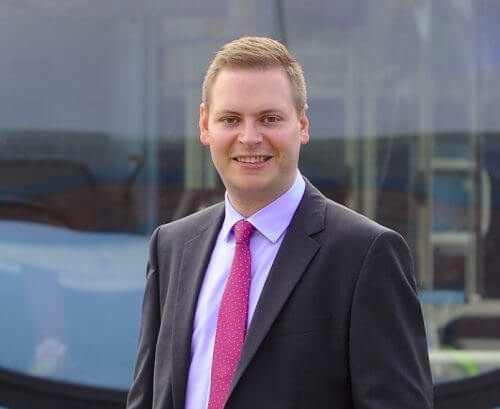 Martijn joins Go North East following a four-year tenure as CEO of Reading Buses; prior to that, he spent nine years at Arriva and founded Thames Bus in 2002, which was subsequently sold to Centra. Martijn began his career as a scheduler for London Underground – and remains a licensed bus driver. His new company, Go North East, is the Newcastle region’s third-largest employer – with a 2,000-strong workforce. It runs 700 buses across Newcastle, Sunderland and Durham, carrying 75 million passengers each year. This announcement follows February’s news of former Go North East Managing Director, Kevin Carr, retiring after over four decades with the company. David Brown, CEO Go-Ahead Group, said: “We are delighted to have Martijn join the leadership team at Go-Ahead. “Martijn’s history of delivering customer excellence and stakeholder relationships is an asset to the business. Martijn added: “It is with great excitement that I am taking up the role of MD at Go-Ahead’s regional bus operation in the North East and at such an important time for the local economy and its transport network.